A house of cards, a 52 day evolving exhibit is the latest and greatest creative project from Steve, our creative director. He has created a giant pack of cards and the premiss is that every day a new card get drawn from the pack and used, with the cards already drawn, to build that days’ card house. Friends and public have been invited to book a day and come and participate in the project which is nearing it’s half way point. This is a press release issued on day 20 to draw attention to the themes of the exhibit, shelter and housing affordability. 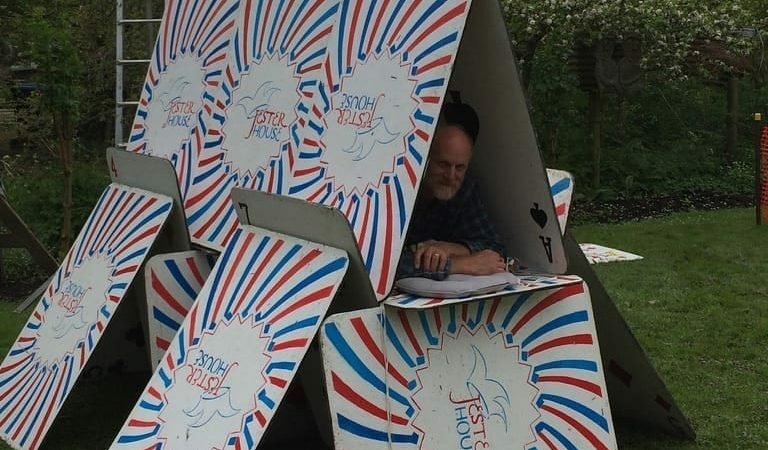 “Day 20 sees Tasman artist Steve Richards reveal his hand and build a card house he can sleep in. The exhibit finishes 12 November, there are still plenty of days available if you would like to come and participate. You can follow progress on Jester House instagram and facebook.